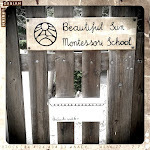 Beautiful Sun Montessori: I forget. I was going to write a big long thing about busyness and about helping and then I had a thought. I forget sometimes that it is more important to pay attention to How I am Being than What I am Doing. I get lost sometimes in the helping and doing, in the teaching and yes, the correcting. I forget the listening, the smiling, the breathing and laughing. The deep noticing that comes from connecting. We have two more days before the holiday and I am moving so quickly. There is time.